WELL-DONE ALERT: Spectris said to...- Part 2..
...the next you're the feather duster". 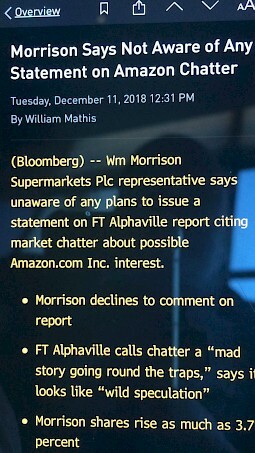 I'm not sure I have ever seen such a comment - "not aware/unaware of any statement on Amazon chatter" - from a company spokesperson (see below) in reaction to a market tale. Just 48 hours after Betaville's RARE alert on Chelsea FC/Stella EOC it is revealed by former colleagues at The Daily Telegraph that the proprietor of the club is to be targeted by British intelligence as part of a sustained campaign to disrupt Vladimir Putin, the Russian president. Below is a link to Con Coughlin's piece:..
Football club M&A tends to operate in parallel universe to standard City dealmaking. Well, at least that's what Betaville has experienced over the last decade of covering mergers and acquistions for the business sections of some of Britain's top newspapers. So, the party season has begun. This week Betaville was lucky enough to attend one of the best business parties of year - and it was packed with some of the City's top grandees. RARE ALERT: Meritage Homes Corporation said to be targeting William Lyon Homes; President and CEO says "no deal"